The tale of Synch and Monet actually doesn’t even begin with either but with 90’s fad Jubilee. 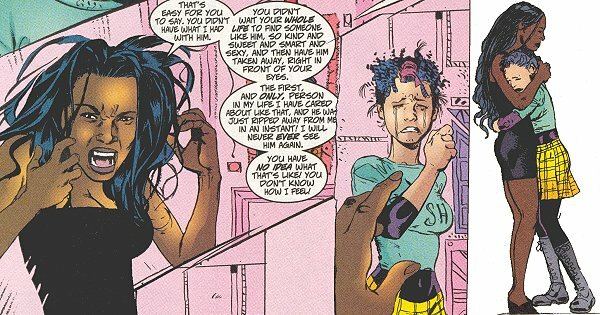 Jubilee had been on the scene for a number of years without a significant other. 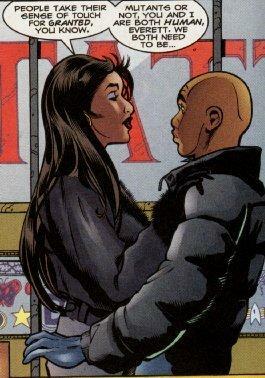 There wasn’t much left to do with her character so when writers got together for the “Phalanx Covenant” it was decided almost immediately to create Synch for the major role of Jubilee’s Leading man. With his power to be at ease with everyone and his maturity contrasting hers, they were perfect for each other. They even showed up as lovers in the “days of future past” as two of only a handful of x-men to survive the Sentinel genocide. Flash forward to Generation-X when Synch meets Monet. 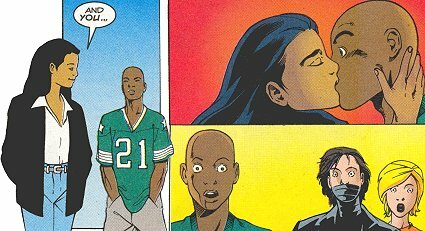 (I’m ignoring all convolution for you to understand this thing lol) No sparks seemingly fly between Synch and Monet BUT herself and Jubilee become instant rivals by virtue of personalities. The spar verbally and Physically over the course of Generation X until, Monet confident as she is makes a play for Synch right in front of Jubilee. Sure they get captured before they can get physical but the seeds had been sown Jubilee and Monet wanted the same thing, the man named Synch! Flash forward again as Monet and Synch got ever closer and Jubilee by this time was left in the dust. They fell in love, Monet trusted him completely, he’s arguably one of only two people she’s ever let into her psyche. Love however was not enough. Hell bent on revenge against headmistress Emma, Adrienne had turned the school into a wasp nest of mutant phobia and even planted bombs throughout the school, all so she could Kill Emma’s students, Synch and Monet included. In a bid to save the human students Synch threw himself on one of the detonating bombs all while in telepathic link with his lover Monet. She experienced his death and arrived seconds too late. As she cradled his lifeless body in her arms tears streamed from her eyes. 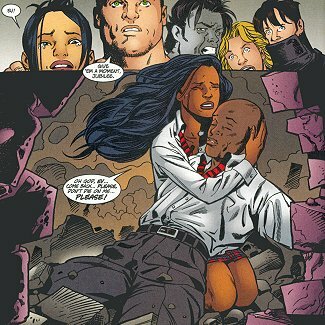 She took his death very hard, harder than any other teammate including Jubilee who had also professed to love him. His death is one of many horrors which haunt Monet to this day.